BCCK management and staff pose with the rAWr Award Malaysia Business Events Awards of Excellence 2015. 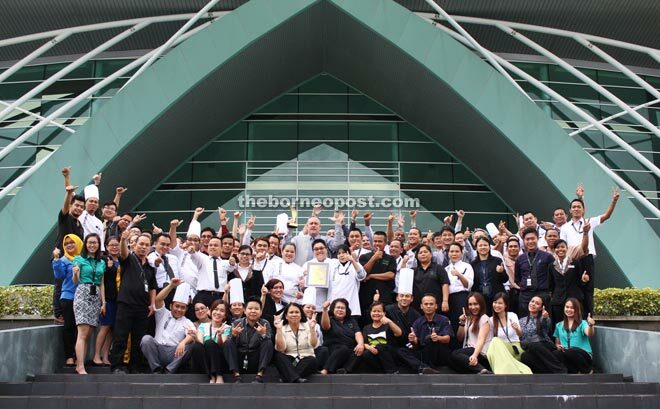 KUCHING: The Borneo Convention Centre Kuching (BCCK) was adjudged 2015 Recognising Award Winning Results (rAWr) Award Winner of Malaysia Business Events Awards of Excellence at the rAWr Awards 2015 in Kuala Lumpur recently. The convention centre was the winner of the ‘For the Purpose Built Convention and Exhibition Centre Award for Excellence’ (below 15,000 square metre gross saleable space) category. The award is a joint initiative between the Malaysia Convention and Exhibition Bureau (MyCEB) and Malaysian Association of Convention and Exhibition Organisers (MACEOS) and has been held bi-annually since 2013. Created to recognise the professional standards, innovation and best practices achieved within Malaysia’s business events industry, it is judged by a panel of independent industry experts within the Asian region and supported by the Ministry of Tourism and Culture Malaysia as well as Tourism Malaysia. Borneo Isthmus Development Sdn Bhd (BID) chairman Datuk Raziah Mahmud-Geneid congratulated the BCCK team for winning the national-level award. “Since BCCK was debuted by the Sarawak government to further progress our state’s business tourism efforts through the hosting of business events, we have witnessed BCCK growing from strength to strength. “From hosting notable events of national, regional and international scales including local events, winning hosting bids to clinching culinary and business awards, Kuching as the destination alongside BCCK as the convention venue has emerged as a strong contender amongst the country’s second-tiered cities’ convention centre,” she said in a press release. BCCK chief executive officer Eric van Piggelen said they are grateful to MyCEB and MACEOS for recognising the efforts of the BCCK team with the rAWr Award. “Our winning this award is directly attributed to the passion and commitment of our team in striving to stand out for quality service and adding value to our clients’ events. “The team has always worked hard to meet our clients’ expectations; however, it is their passion for excellence in best practices and innovations that differentiates us from the competition,” he said. He added that with the accolade, the BCCK team was looking forward to winning more event hosting bids while at the same time taking pride in their ability to offer local event organisers an award-winning world-class convention facility in Kuching.